Webster University student Ashley Mess has made history. The senior media communications major was named a National Soccer Coaches Association of America (NSCAA) 2015 Scholar All-American, becoming the first women's soccer player in St. Louis Intercollegiate Athletic Conference history to earn the distinction. 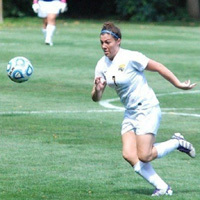 Mess (St. Louis, Mo., Northwest High School), previously named to the NSCAA All-Central Region First Team, was a Third Team Scholar All-American. The NSCAA All-American Team that is selected from not only NCAA III schools but all NAIA and NCCAA schools as well, numbering over 700 programs total. To be named to the NSCAA Scholar All-America Team, a student-athlete must have at least a 3.30 cumulative grade point average (GPA) on a 4.0 scale throughout her career; start more than 50 percent of all games and be a significant contributor to her team. Mess has a cumulative GPA of 3.88 at Webster, majoring in media communications in the Webster University School of Communications. The academic honor caps an impressive college career for Mess. Earlier named the St. Louis Intercollegiate Athletic Conference 2015 Co-Defensive Player of the Year, she was also a SLIAC First-Team All-Conference selection for a second straight year. She anchored a Webster defense that allowed just 21 goals in 19 games this past season. Mess finished the season with four goals and five assists. During Mess' four years as a Gorlok, Webster went 33-2 in the SLIAC over that period. Webster was 13-5-1 overall this year, winning the SLIAC title for a fourth straight season with an 8-1 record. Follow more athletics news at the Webster University Athletics site.